Having gamed for a good number of years, I surprisingly never got around to making or obtaining any kind of dice trays. Always just gently rolled them on the corner of the table, but wanted to finally have them contained to keep them from flying off the table edge. Strange to say but it's one of those weird things in gaming that some seem to agonize over: they make them out of things like picture frames or shoe box tops or whatever. I really didn't want to have to turn something so simple into yet another project! So while I was in Walmart I put my head into focusing all around the store for something suitable. I finally found it and I feel like a total daff for how I could not have thought of it sooner. 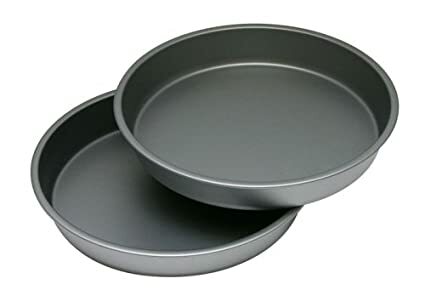 Cake pans! Absolutely the perfect thing for this. Any shape and size you can think of, round or square. They come in the perfect color for gaming, steel gray. And they are made of the most durable material possible, metal! I picked up two of these 9" round ones for about $4.50 USD each. Instant dice trays! My first thought as well, loud. Then glue a piece of felt to the bottom and sides. I will stick with the shadow box picture frames I picked up at Michaels on sale with a coupon. It's simply a matter of disassembling the frame taking out the glass and putting it back together without it. The bottom is nicely padded for pinning things to as a shadow box frame. I did mount them to a piece of self sticking floor tile cut to size, so that they will slide nicely across the table. I get free cardboard cigar boxes from the local tobacco store. Cut the top off and line with felt. If I feel real fancy I can get wooden ones for $3.00 USD each, but i normally use those for storage. Surprisingly they do not smell like cigars. I had thought of something similar but to also coat them with that spray rubber sealant to cut out the noise. Another thing I did use was glass bowls from an arts & crafts store. Something you might see with decorative colored beads poured in them. I got two "bowls" that had completely flat bottoms (approx. 4" or 5") square. This allowed the dice to rattle around a little before settling down on the bottom of the bowl. My wife gave me a soft Millenium Falcon lunch box, which makes an excellent dice box, especially for science fiction gaming. The separate tray-like sectional pieces of drawer organizers work well too. PS. Oberlindes, that's an awesome lunch box! I got some RubberMaid drawer organizers, painted them green, and because I am too meticulous, tossed on some flocking to the wet paint, to match the table top. there is just enough noise to let people know the dice have been thrown. One for each corner of the table. Pretty cheap too. I use a wooden container that held a child's puzzle my grand daughter no longer plays with. I glued a piece of foam to the bottom to muffle the noise. I went to the dollar store and got mine for $1.00 USD each plus the felt. I use a small glass snack serving bowl. Nothing fancy, just clear and with sufficient flat bottom space. I like the noise. It reassures me that the dice aren't just sticking without bouncing. If you need silence, break out the electronic randomizers. And don't allow any table talk, joking, or laughing. I just can't warm up (heh) to the cake pans. They'd lack the heft of feeling anchored to the table. And my wife is an accomplished cake maker. They'd be constantly commandeered. So I tested the cake pans, yeah they are fairly noisy but not as much as I thought they would be. Still, some felt wouldn't hurt to quiet it down. What type of adhesive would work for gluing felt to a steel surface like that? Also, it was mentioned above using rubber sealant spray. Would that stick to a surface like that? Baranovich, I hope they're not non-stick pans. Felt can be had with a sticker type backing. Even the no-stick pans get labels stuck on 'em. But you may only have one try to get it straight … round … whatever. I have been known to use paper plates in the past. You can also use neoprene toolbox sheets from Harbor Freight or Home Depot. Easy to cut and is pretty tacky, so it won't slide around in the pans. Yep, should have listened to you guys first! The cake pans were way too noisy! Rather than the hassle of finding something to glue to them to quiet them down, I just took some rustic wooden picture frames from the craft dept. at Walmart and glued a piece of green craft felt into each one with Elmers PVA glue. Took about five minutes and I spent at total of $10.00 USD. Medieval Japanese wargames necessitate origami boxes made from construction paper or appropriately themed wrapping paper, if you have it.